Арте́к (English: Artek) is an international children center (a former Young Pioneer camp), which was a vacation or summer camp) on the Black Sea in the town of Gurzuf (also written as Hurzuf) located on the Crimean Peninsula. It was established on June 16, 1925 and at first it was called "Лагерь-санаторий в Артеке" (English: Camp Sanatorium in Artek), a sanatorium for children suffering from tuberculosis, on the initiative of the Russian Red Cross Society. The camp got its name at the location - in the tract of Artek on the bank of the river of the same name (the original name is "Camp in Artek"). The origin of the word itself, like many other Crimean toponyms , does not have an unambiguous interpretation. The most well-founded versions link him to the Greek words "άρκτος" (bear) - according to the location of "Bear Mountain", "oρτύκια" (quail), "άρτος" (bread) or Tatar "artyk" (buffalo). In the camp itself, the most popular is the version associated with the crossroads . There is a stable expression "Artek - quail island" and a song with this name. Gradually, "Artek" went from a small summer tent camp and grew into one of the world's largest complexes of children's recreation. Artek was considered to be a privilege for Soviet children during its existence, as well as for children from other communist countries. Early in 2014 season, during dispute between Ukraine and Russia over the status of Crimea, the staff of the camp officially moved from Crimea to Bukovel, in Ivano-Frankyivs'k County, in the Carpathian Mountains. The centre was named "Международный детский центр" (English: International Children Center ("Artek-Carpathians"), abbreviated to MRIA Artek) and consisted of three camps. Meanwhile, the original site in Crimea remained open. Photo of the flag at <www.voyeurweb.com>. The flag is horizontally divided white-blue-yellow-light blue, with, in the middle, a circular emblem whose diameter equals the height of two stripes (therefore stretching over the blue and yellow stripes). The emblem shows the blue silhouettes of three human beings on a yellow background, and is surrounding by the writings, in Capital letters: KIEV COMMONWEALTH OF NATURISTS - below the emblem, in blue letters [...] The equivalent in Ukrainian - above the emblem, in yellow letters. The three silhouettes on the emblem form a trident, which is, most probably, not coincidental but a countercoloured reference to the national symbol of Ukraine. Not surprisingly at all. It seems to me that the central two stripes are probably designed to deliberately echo Ukraine' national colours and tryzub. If I had to guess the actual maning behind the flag's colours (always risky, I know), it looks like the central stripes for Ukraine, with sky blue and white to represent the open sky - therefore, Ukraine naked under the sky ("sky-clad"). I would say it is not light blue but (supposed to be) green. Or maybe it is acqua? The writing is "Київська Співдружість Натуристів" ("Kiivshka Spivdruzisth Naturistiv"), but in their site Russian language is used also: "Киевское Содружество Натуристов" ("Kievskoe Sodruzestvo Naturistov"). Another image of the flag (probably of the very same flag) in the club’s website. Image of the emblem is here. 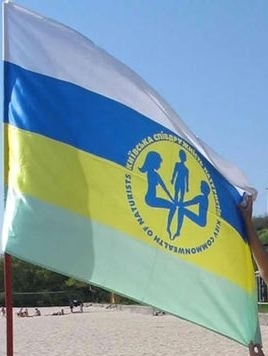 The flag of Red Cross Society of Ukraine is white with logo.